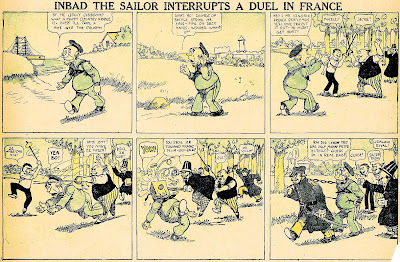 Wednesday, February 25 1908 -- Battling Nelson goes out to sea on a day off from training, but the big news is that a certain duck character is named here for the first time, almost two years before he enters the pantheon of Herriman comic strip series. In 1930, Brown was married and lived in Morrisville, Pennsylvania at 456 Stockham Avenue. According to the census, his wife, Alice, was 17 years his junior; they had a five-year-old daughter. He worked as an insurance agent. He signed his World War II draft card on April 27, 1942. He lived at 615 North Pennsylvania Avenue, in Morrisville, and worked for the Prudential Insurance Company in Princeton, New Jersey. His description on the card was "5 ft 10 in, 170 lbs, blue eyes, sandy hair." He was well known as a cartoonist, having created the "Willie Green" comics, and was a cartoonist with the former Philadelphia Record for 30 years. He also had done commercial art work. This is my great grandfather! However, although the Record wasn't awash in color, they did make a nod to running Sunday comics. 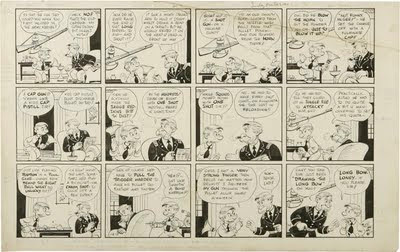 For over twenty years they featured a half-page homegrown strip in black and white titled Willie Green. 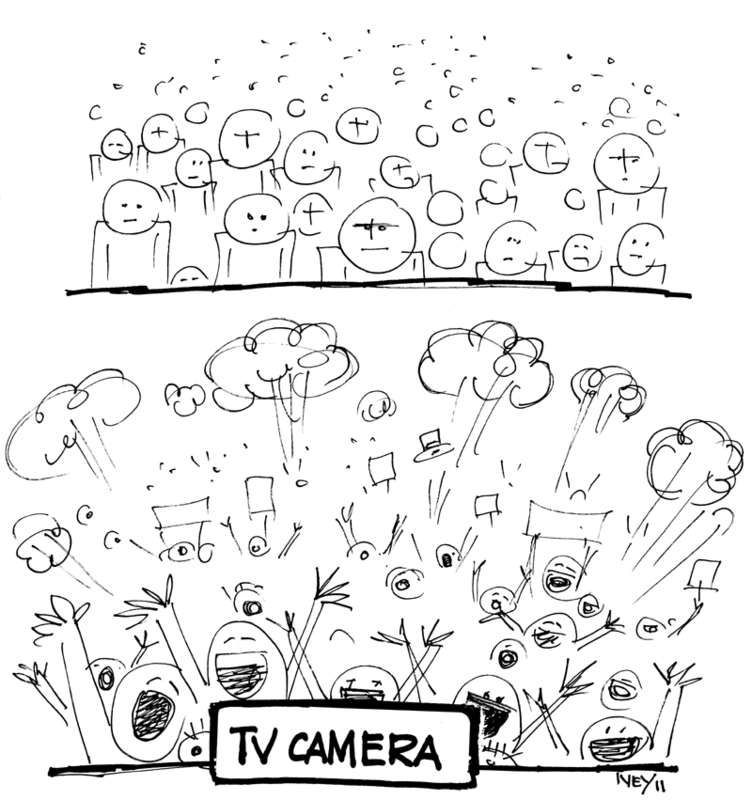 This wasn't by any means the only strip they ran, but when it did run it was always clearly the star of the show. Most of the other strips tended to be daily size. Willie Green disappeared at that point, and other minor strips ran in its place. Eventually even these pretty much petered out. 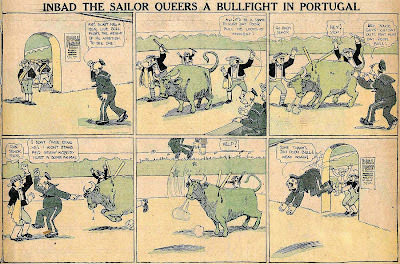 Then as the new year of 1914 rang in, the Record added a Sunday color comic section, courtesy of Hearst's new Newspaper Feature Service syndicate. In addition to the color section, Willie Green came back. 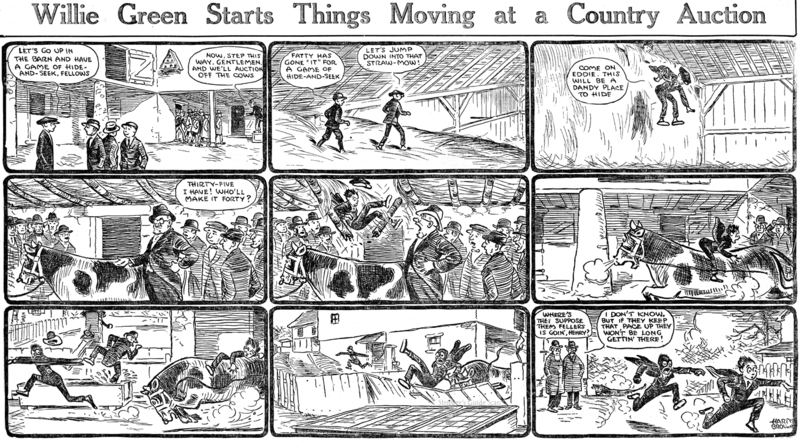 This time the strip ran from January 4 1914 to September 3 1916 (today's samples are from this interval). It was during this run that a pair of reprint books were issued through the Frank M. Acton Company. Both are quite rare. Once again Harris Brown took flight, but again he returned. On November 18 1917 the strip is resurrected yet again, only to stop on July 14 1918. 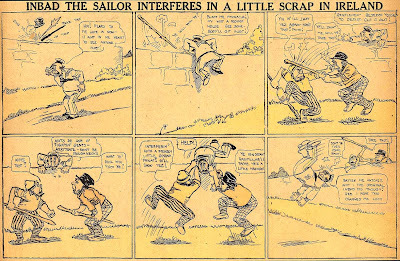 This time Brown was gone for quite awhile, but either the pull of cartooning for the Record was too great, or his luck at other ventures was too bad, because on May 22 1921 he's back. But not for long. This run ended after a bare six months, on November 13. It was in this period, however, that Brown self-published another Willie Green reprint book; perhaps the 1921 run was intended purely as a bit of promotion. Willie Green then pops up in the darnedest place, as a feature of World Color Printing's weekly children's activity page. I believe these are reprints of earlier material. One has to wonder if Harris Brown or the Philadelphia Record sold them the rights. Anyway, whatever the arrangement was, it didn't last, as Willie Green ran only three times on that page. Why Brown did this feature in fits and starts is a mystery to me. But maybe we'll learn some clues tomorrow when Alex Jay contributes an Ink-Slinger Profile of Harris Brown. Abian Anders "Wally" Wallgren was born in Philadelphia, Pennsylvania on June 4, 1891, according to Find a Grave. The 1900 U.S. Federal Census recorded the Wallgrens in Philadelphia at 1631 Chadwick Street. His birth was recorded as "June 1891" and he was the oldest of three children born to Abian and Hilma, both born in Sweden. His father was a tailor. …[Wallgren] was among the first to see service in France as a buck private and regimental sign painter, a post which army logic assigned him on his "professional" record. According to his own account for nine months he painted "Latrine" and "Officers Only" signs up and down France, from St. Nazaire, through Menaucourt, to Damblaine in the Vosges. Private Wallgren's light, however, was being kept under a bushel. 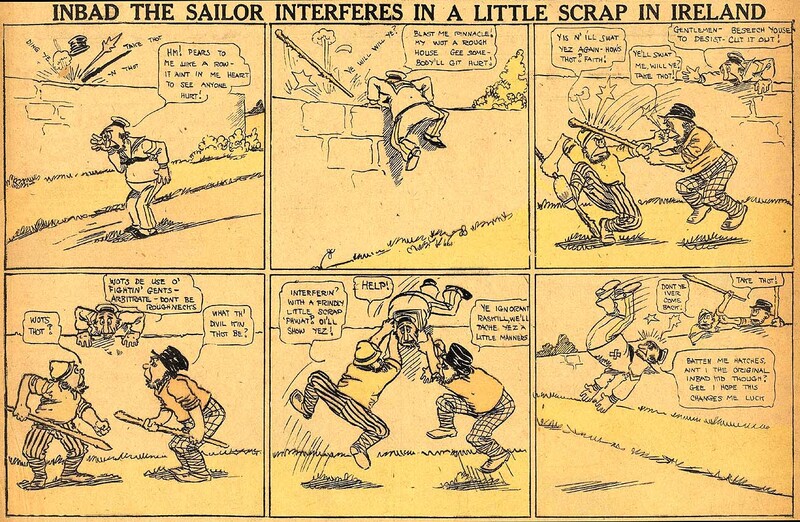 His great opportunity came when the Stars and Stripes was started as the official newspaper of the AEF [American Expeditionary Forces], and Wally was placed on the staff as cartoonist. 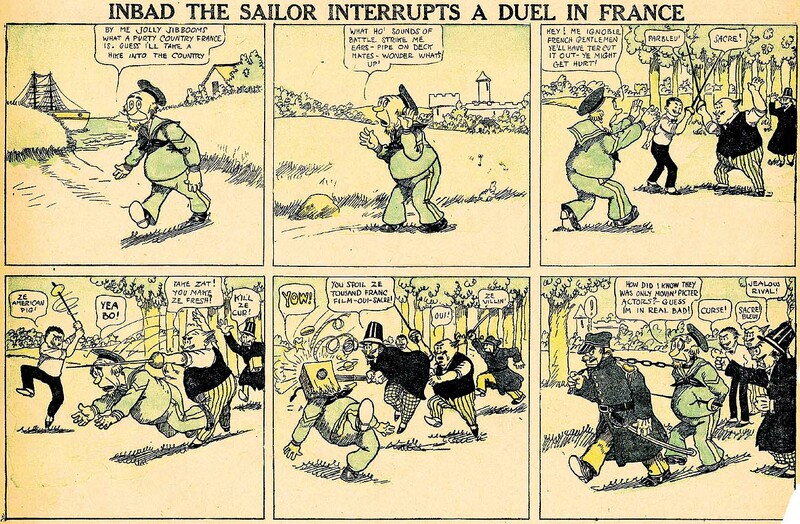 In February, 1918, he was transferred to Paris and drew cartoons for this doughboy newspaper throughout the War, until the final issue in June, 1919. …Incidentally, Wally's utter indifference to deadlines was a cause of continuous, albeit at times humorous, exasperation to his superiors. As John T. Winterich, another brilliant staff member, put it in his history of the paper, "Squads Write! ": "The extraction of a weekly strip from Private Wallgren became one of the more monumental tasks of the war." Philadelphia, March 25.—(AP)—Abian A. (Wally) Wallgren, 56, cartoonist for "Stars and Stripes" during the first World War and later with the American Legion monthly, died yesterday after a long illness. Among Wallgren's creations were "Inbad the Sailor," "Hoosegow Herman," and "The Saluting Demon." This is really beautiful stuff. This guy should be better known. The "Inbad" strips are highly Opper-damaged, but that later one is so refined, almost European in style. I'm impressed. Sometimes destiny plays a cruel trick on us. Take the example of Wally Wallgren. If ever there was a fellow who was unfit and undesirous of any connection to the military, it was Wally. He was, to put it charitably, a free-spirit. He did not recognize authority, he was lazy, he was unable to keep a schedule, and he was a compulsive smartass. The one thing he seemed to take really seriously and to pursue with gusto (besides cartooning) was drinking. Let's just say that Wally sure as hell wasn't officer material. So naturally fate ensured that Wally's entire adult life ended up entwined with the military. When he wasn't in uniform, he was cartooning about military life. And here's where it all started, in 1911, with Inbad the Sailor. Why Wally chose a sailor for this series I cannot fathom. It's not really germane to the idea, other than providing a pretext for an ever-changing setting. And this was long before the military should have even been on his radar (he was drafted for World War I). But he did, so I get to tell you that this is Wally Wallgren's very first military-themed strip, a portent of the next 30+ years of Wally's life. 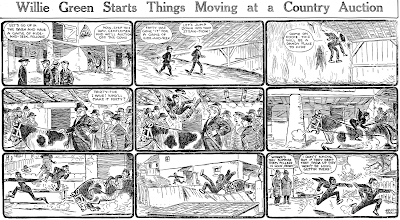 Then Montone returned to the U.S. and sold the strip to the Chicago Tribune-New York News Syndicate. According to Montone the strip was initially tried out in the syndicate's flagship papers, and then was generally syndicated starting on February 12 1968. In the U.S. the title was changed to Kiwi; Montone says this was because the original title was considered "somewhat naughty". (I hate to admit ignorance of anything naughty, but I confess I don't see what's off-color about the title Birdwirds). Things were tough, though, for the two creators. Kirby tried to immigrate to the U.S., but was unsuccessful. The two creators ended up collaborating long distance, with Kirby living offshore in Barbados. In 1970 the partnership carried on by mail and long-distance calls proved too much, and Kirby dropped out as co-creator of the strip. As Montone tells it, it was the beginning of the end. "By this time, the strip was suffering from a myriad of problems and the circulation showed it. In 1971, CT/NYNS and I parted company". PS -- The co-creator's name is definitely Montone, not Monotone -- my samples from the San Francisco Examiner seem to have been typeset by either a practical joker or a comic strip critic.